Cox Automotive Industry Update Report: July 2018 - Cox Automotive Inc.
ECONOMIC INDICATORS: This year’s New vehicle sales are forecast to be approximately 16.9 million as steady long-term growth continues. 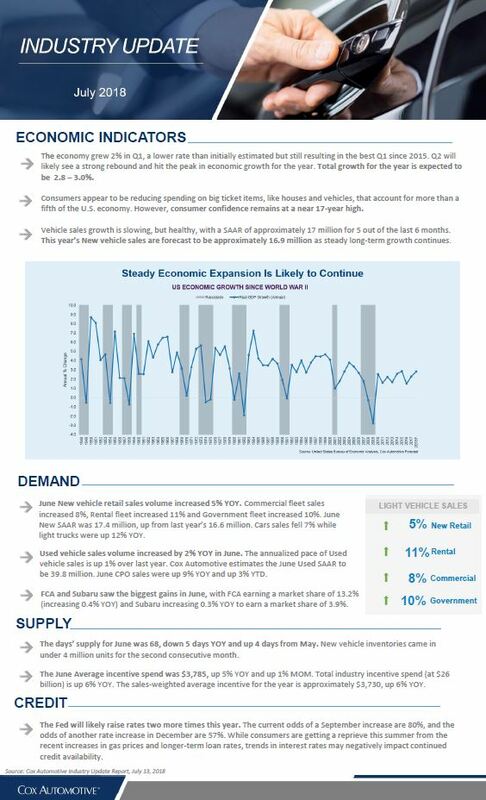 DEMAND: New vehicle retail sales volume increased 5% YOY and Used vehicle sales increased by 2% YOY. SUPPLY: The days’ supply for June was 68, down 5 days YOY and up 4 days from May. A monthly report leveraging Cox Automotive’s multifaceted insight into the automotive marketplace to provide an overview of economic indicators, supply, demand, credit and other vital topics and trends affecting the industry.